A times table can be a great aid in learning all of your multiplication facts. Check out this interactive times table at NCTM.org to see how the numbers work together and some of the patterns of the products. You can even test your knowledge by covering and uncovering the numbers in the chart! Then, play the Times Table Grid Game to try out all of your new knowledge! How quickly can you recall your multiplication facts? How about your division facts? Addition? Subtraction? Whatever the fact set you might be working on, Math-Drills.com can be a great resource to use. Whether you practice with a timer or without, there are many different types of pages you can print and practice on as often as you would like. Looking for a little extra practice learning your multiplication times table? 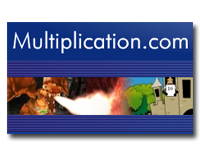 Check out Multiplication.com This intractive site is full of games you can play to practice your multiplication facts. The sight adds one new game each month, so keep checking back to see new games! Try out a few of these multiplication games at FunFortheBrain.com How many different levels can you reach? What do Skater Math, Number Eaters, and Space Race all have in common? They are all fun ways to learn how to multiply! Try out your multiplication skills at Hooda Math! Ready...Set...Play! Interactive Sites for Education is full of fun math games ready to challenge your wit and satisfy your need for adventure. What better way to learn math then through playing a game? Earn pirate's treasure or play a game of basketball using your math knowledge at MathPlay! Have fun playing some multiplication games at Gamequarium Multiplication.